Street Champions is a volunteer scheme that is part of the Pride in Our Community programme to encourage residents to take a more active role in their community. As a Street Champion you will provide a positive influence within your community, improving the local environment by informing the Council of areas of concern. You will also be invited to events in your local area to make improvements and provided support should you wish to organise events yourself. You will be provided with a Toolkit for reporting an issue or defect within your street or neighbourhood. All Street Champions will receive an equipment request form. From this you will be able to order certain items to help you make a difference in your area. These things will include graffiti removal wipes, and litter picking equipment. In return for your help, we promise to take appropriate action as quickly as we can and keep you informed of actions that we take. 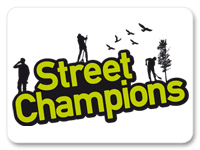 You can sign up to be a Street Champion using our online form. Why become a Street Champion? By becoming a Street Champion you can put something back into the community and help improve the environment you live in. It's simple and easy, all you have to do is tell us about your concerns ranging from damaged street lights to graffiti and we will do the rest. As a Street Champion you will be encouraged and supported to organise community events that improve your neighbourhood and local environment, such as litter picks and improvements to untidy pieces of land. We will also invite you to events that other organisations have arranged although it is up to you if you attend. The list is not exhaustive. If something is of concern, then let us know and we may be able to deal with it. If, for any reason, we can't then we will explain why, as well as try to put you in touch with the right person to talk to. How will Telford & Wrekin Council keep in touch with me? You will receive two newsletters a year which will keep you updated about the scheme and also provide information about topics of interest and events. How do I become a Street Champion? Another easy way to sign up is by using our mobile app. Visit the everyday telford page for more information or search for everydaytelford in your app store. You can also email us at pride.officer@telford.gov.uk or call 01952 380455.